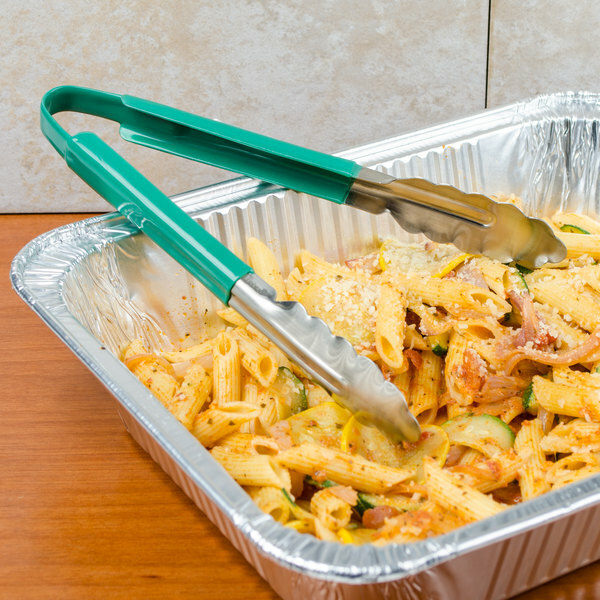 Both versatile and economical, utility tongs will often be some of the most utilized items in a professional kitchen. They can be used in both the front and the back of the house for anything from grabbing pieces of food from the buffet or flipping meat on the grill. Featuring a one-piece stainless steel design with plastic-coated handles for an easy grip, this pair of tongs will be your new favorite utensil. Measures 9 1/2" in length and is available in three other colors, including yellow, black, and red. With different colored handles, you can easily designate a particular color for specific use in the kitchen to help reduce cross-contamination. A scalloped end design aids in picking up just about any type of food. These tongs were a great purchase. Their shorter length makes them a great solution where the longer ones were too bulky for ease of use. Excellent product. These are great for in the kitchen! The rubber coated handle make it more comfortable on your hands for plating large quantities. We rate them a 10 out of 10! These hold help well in a high use kitchen and have not shown any signs of wear or tear after months of daily use. The coating on the handles has held up fine. Very handy tongs. They are great to use for gatherings. I purchased these and the black coated ones for home and church use. The coated handles make it non-slip enabling gripping foods much easier. We use these tongs daily! They are easy to hold and don't slide out of your hand. They work perfectly for picking up desserts, like donuts or cookies, on our dessert table. Same great quality but for a fraction of the price.. I was pleasantly surprised at the quality of these tongs. These have a great price. These scalloped tongs are amazing. They are stainless steel but yet lightweight. They are not flimsy. The scalloped edges help you grab and hold things without tearing them up. Great quality. This utility tong can be used in the kitchen and it is also nice enough to use for a buffet or self serve food station. This tong features a green coated handle which makes it easy to grip and the color makes it easy to identify. Because of the coated handle we would suggest handwashing these tongs. 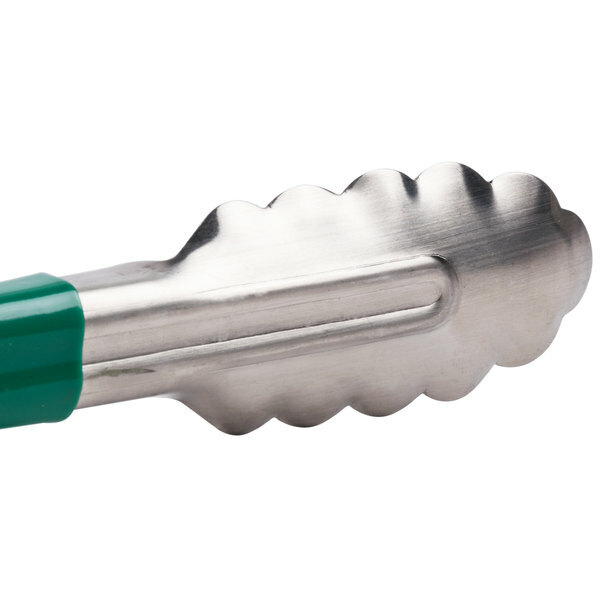 The 9" Stainless Steel Green Scalloped Coated Handle Tong is a good cost effective tong. While they are not long lasting, they are exactly what I needed. These are great for buffets or home use. Great price for these. They don't last forever but I think the price reflects this perfectly and I've purchased several of them just to have them close by! The 9" Stainless Steel Green Scalloped Coated Handle Tongs are one of my favorites. The quality is excellent, they definitely exceeded my expectations. The coated handle is great, no worries of the tongs slipping out of my hand while in use. These are a must have for any kitchen wth protection in color so II don't have cross contamination they are great for any food safe kitchen. These tongs are on the lighter weight side but going into this I know the cost is lower so I'm getting a product that is not the best ever made. 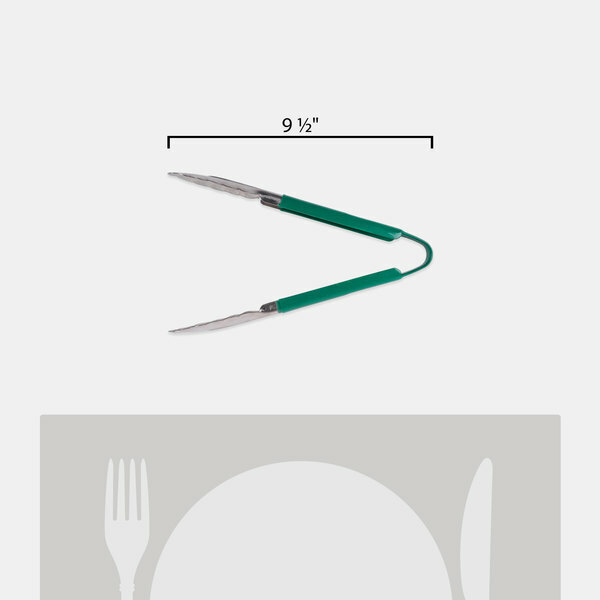 I use green for salad service and they do the trick and I'm pleased with the low price tongs for what I use them for. Bought these after having to put green tape on regular stainless tongs. Best decision ever! These last a lifetime and are perfect for color coding veggies. My team and I love these! This tong looks and feels great. The only complain is the tension might be stronger and tires your hand when using it. I tried reducing the opening angle by compressing the top spring loop. It helps but now the opening of the tong is not as wide. I bought this for the shorter length to fit into the salad bin. Great pair of tongs, we like the poly cover, specially in buffet settings, when you don't want to get your customers burned. Also, different coloring is a great idea for easy use ID. Used the 9" Stainless Steel Green Scalloped Coated Handle Tong to pick up a white bread slice. The price for these tongs is really great. Such a great deal. Nice tong to have at home. These green tongs are very useful when you need to pick something out of boiling water, hot oil, or when working with charcoal. The coating helps me grip the tongs better. Not a big fan of these tongs, simply because for little money more, you can get a much nicer pair of vollrath tongs. Very small, the green rubber is nice. These are high-quality tongs for a great price. I love how the entire handle is covered in rubber. The one drawback is that they don't have a hook to hold them closed for storage. Just what the Chef's ordered, great contruction, color coded to abide by the health department regulations. Great product, always what we need in the a fantastic time frame. 9'' Stainless Steel Green Scalloped Coated Handle Tong. The price is cheap but the quality isn't. They stand up to heavy use in kitchen and the coated stay cool to the touch. I've been using these tongs for around 3 years and they are still just like the day I bought them. The plastic coating in different colors are a big plus, too. Quality stainless steel tongs. The colored handle and the other available colors make it a breeze for our kitchen staff to pick the proper tongs to avoid cross contamination. 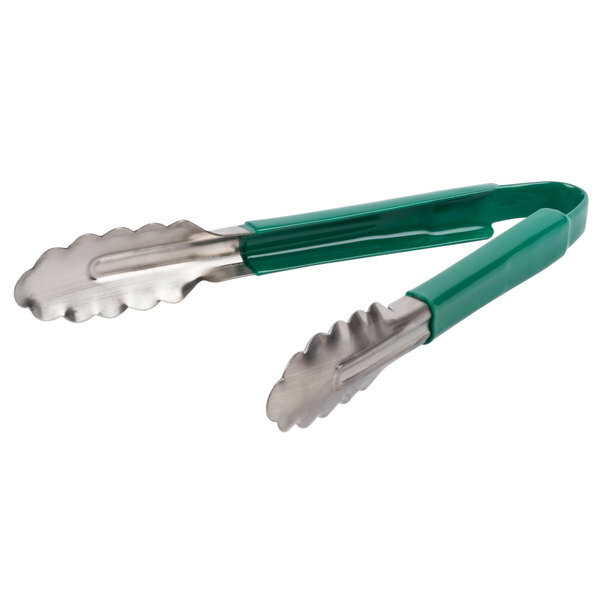 The 9" Stainless Steel Green Coated Handle Tongs are excellent for knowing which tongs are use for which dish. Green is good for tossed salads.